Candlestick charts offer a different way of looking at price charts than standard technical analysis and bar charts. And new tools can help you light the way. Are you a head-and-shoulders, pennant and channel person, or do you prefer the doji, shooting star and Harami? In other words, when studying charts, do you follow traditional technical analysis and bar charts, or do you prefer candlestick charting? 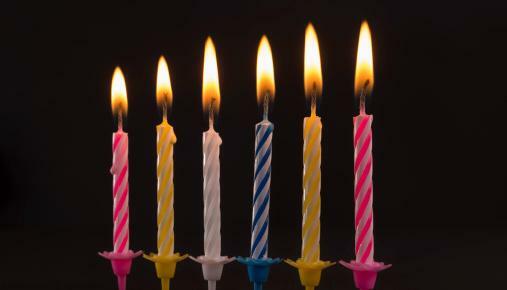 If you are looking for some extra illumination in your trading and investing, candlesticks may be the answer. Many veteran trend followers, and a good many casual market participants, may be familiar with standard technical analysis and the patterns and lingo that define it - head and shoulders, triangles, double tops and bottoms and the like. These tools have been an integral part of stock and commodity analysis since followers of Charles Dow and his Dow Theory formed the basis for such analysis in the early 20th Century. Though candlestick charting technically predates Dow Theory, it was not introduced to the West until Steve Nison released his 1991 book, "Japanese Candlestick Charting Techniques: A Contemporary Guide to the Ancient Investment Techniques of the Far East." Since then, candlesticks have attracted a devout group of adherents who like the way such charts present price information. Bar charts and candlesticks share the same four components for the time period being measured (hour, day, week, etc.) - opening price, closing price, and the high and low prices of the period. In a bar chart, the opening price is represented by a horizontal hash mark to the left, the closing price is a hash on the right, and the period's overall range is represented by a vertical line with the high and low as its endpoints. In a candlestick chart, the open and closing prices define the "candle," the price differences between the candle area and the high and low represent the "wicks," and color coding signifies whether it is an up period or down period. Figure 1 compares a standard bar chart to that of a candlestick chart. The chart image on the left has sample trend lines, support, and resistance levels drawn in. Such lines are the hallmarks of classic technical analysis. Followers use them to identify possible trends and turning points in the market. FIGURE 1: STANDARD VS. CANDLESTICKS. Chart source: thinkorswim® by TD Ameritrade. Not a recommendation. For illustrative purposes only. Past performance does not guarantee future results. Candlestick analysis adds another dimension, in that the shape of each day's "candle" give you visual cues as to the strength and conviction of the price activity in the period. The candlestick image on the right features up to 20 different signals, from the more common doji, hammer and evening star, to obscure patterns like the "homing pigeon" and the "three black crows." Diehard candlestick fans can identify cool-sounding pattern setups such as "three stars in the south," the "concealing baby swallow" and more. Like standard technical analysis, candlesticks can represent any time period - hourly, daily, weekly, monthly and so forth. Candlestick charts also show you the general price trends in similar fashion to those of standard analysis. Shadows, spinning tops, doji and other candlestick shapes can show price activity in the market to help you make trading decisions. Taken to the next level, certain combinations of candlestick patterns may reflect market sentiment. For example, a series of long up candles followed by a shooting star may signal a blowoff rally, but if followed by a doji, may signal a breather before either continuing the uptrend or reversing. But that may depend on the shape of subsequent candles. Since there are countless pattern combinations, and since many traders have different objectives and time horizons, and may employ different strategies, flexible pattern identification can be important to the candlestick chartist. On TD Ameritrade’s thinkorswim® platform, dedicated swimmers - those fluent in the thinkScript® language - have been able to create custom patterns and apply them to charts to identify any pattern combination. 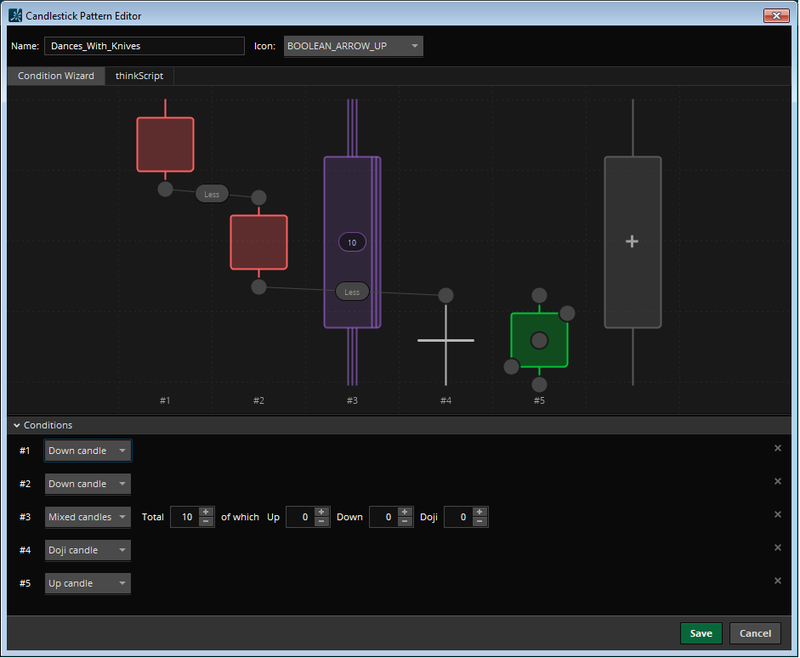 Now, that function has become available to all thinkorswim platform users with the new candlestick pattern editor. The new tool allows you to create a new pattern in a drag-and-drop interface, with no code-writing necessary, within the chart selection location on thinkorswim. Figure 2 shows an example of a custom chart created with the tool. Notice that when you create a custom pattern, you get to create a custom name. The example below has been given the name "Dances With Knives." FIGURE 2: CUSTOM CANDLESTICK PATTERNS. To create your candlestick pattern on thinkorswim, go to Charts > Patterns > Select Patterns > Candlestick. Chart source: thinkorswim® by TD Ameritrade. Data source: Standard & Poor’s. Not a recommendation. For illustrative purposes only. Past performance does not guarantee future results. Check out the following video for more information on this new feature.